The authors’ idea of an open strategy sharing talk connects very nicely to the work of Sherry Parrish in her book, Number Talks. Cathy Fosnot discusses the idea of number strings in the Young Mathematicians at Work Series. Their collective ideas offer suggestions to and encouragement for teachers as they design learning opportunities for students that are focused on building strategies, developing flexibility in thinking, and analyzing how to approach mathematical situations. 1. Counting All: The child (typically) starts at the top left and counts each and every dot. She may start at a different spot or with a different card, but she count by ones. 2. Counting On: The child knows that the top card has 9 dots. She moves to the second card and continues counting, “10, 11, 12, 13, 14, 15” and then goes on to the third card and counts each of the five dots, stopping at 20. As with the counting all strategy, the child may not necessarily start with 9. She may begin with the card that she just knows, that she can subitize, and move into counting on from there. 3. Making Tens: The child looks for dot combinations that make 10 or ways to make a ten. 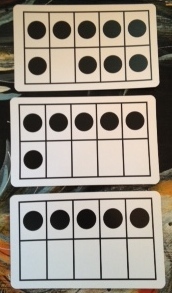 In this case, the student visually moves the dot from the second row of the 6 card into the empty space on the 9 card, decomposing the 6 into a 5 + 1. Now, he has created a 10 and a 5. Then, he can combine the 5 (from the 6 card-with one dot moved to the 9 card) + 5 (the third card); 5 + 5 = 10. So, 10 + 10 is 20. The child might start with the 5 card, and decompose the 6 into a 5 + 1, and say that 5 + 5 is 10. Then, one dot from the 6 card is put with the 9 card, creating ten. 10 + 10 is 20. 4. Doubles: In this example, the doubles strategy and make 10 strategy overlap in the fact that double 5s is 10. The change in language is subtle. The child might start out decomposing the 6 into a 5 + 1, and move the 1 with the 9. Double 5s in the top card is 10. That leaves two 5s in the last two cards. The child says that I know that double 5s is 10. So double 10s is 20. 5. Other: Kiddos will come up with interesting ways because they want to share and they want to have a contribution when the group is asked by their teacher, “Does anyone have a different way?” Kids can get really creative with their strategies and provide you with a great opening to talk about efficiency and that is a good problem to have. FINAL THOUGHTS: If you have been using number talks regularly in your class, at this time of the year most of your students will be able to move the dots around, visually, and hang onto and organize their moves into logical and easily-followed explanations. You may also have some students who will benefit from working with you on this question (or a similar question) in a small group setting. They will be more comfortable using counters and blank ten-frames to help them describe their thinking about the number string. The counters allows kids (and you) to physically move the dots from one card to another; to directly model the thinking being shared in each student’s explanation. If you use two-color counters as your dots or different color counters (such as UNIFIX™ cubes or base ten ones’ blocks) for each number in the number string, kids can actually ‘see’ the decomposing and composing of the numbers. Another option you might want to consider is to use white board markers and write and draw arrows and other notations right on the cards. The marker easily comes off the cards with an eraser or a wipe. So go ahead, organize a number talk for your kids and see what happens. This is a great time of year to try some new things–you know your kids and they know you–everyone is comfortable.